Walt Disney built a barn in the backyard of his new Carolwood Drive home in 1950. 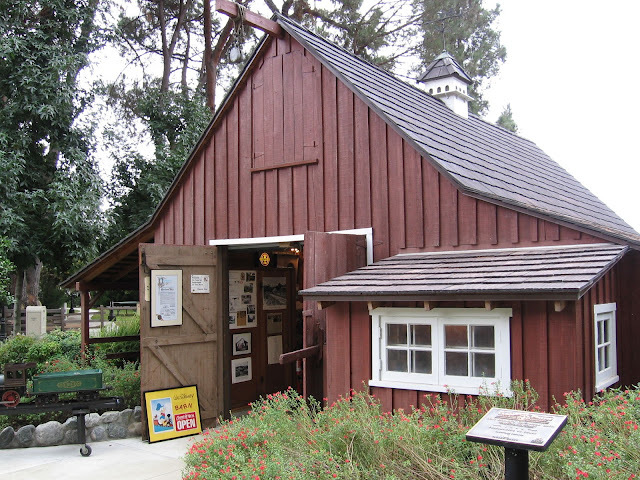 As a Disney building, it was somewhat less than full size, designed by architect and Hollywood set designer John V. Cowles, Jr. Walt installed basic machine and woodworking tools in the barn and it was here that he could tinker with projects when he felt like it. His standard poodle, Duchess Disney, would keep him company, reminding him to go to bed when it grew near midnight. The author (left) and former Imagineer Andy Quarress at Walt's Barn. The Gift Shop now sells Inventing Disneyland. 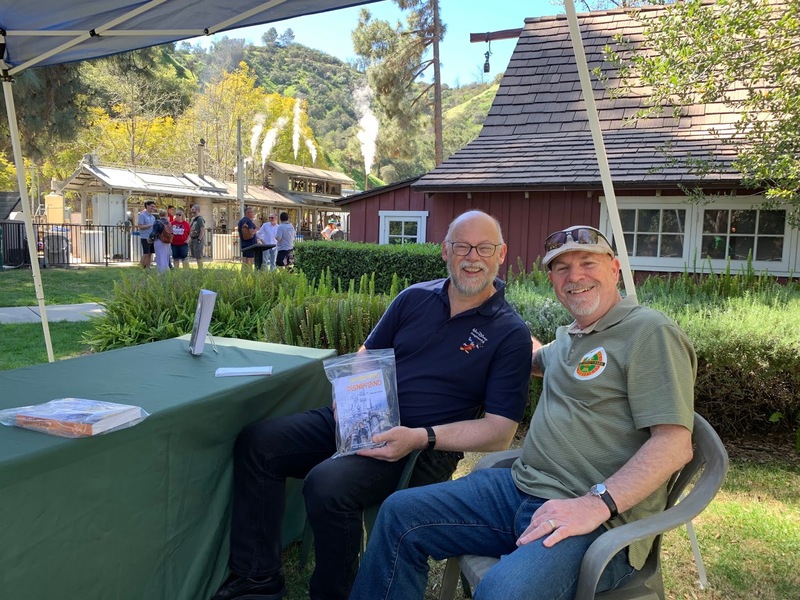 I was honored to spend St. Patrick's Day, March 17 at the Barn, signing copies of Inventing Disneyland. Doug Marsh of the Carolwood Foundation, which operates the Barn, was our gracious host. He gave us a special tour of the Santa Fe & Disneyland Railroad Combine Coach, pointing out the original sheet metal door from the 1955 Disneyland Roundhouse. 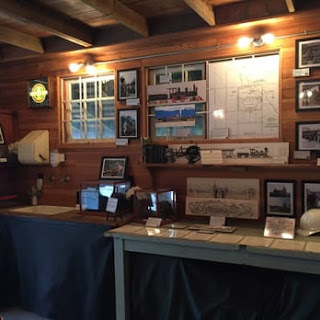 There were two doors, because there were two locomotives on two tracks, and the number "2" is indicated on the door. 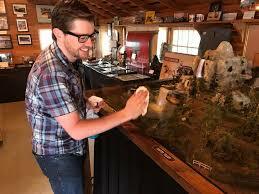 The barn is a museum, packed with memorabilia from Walt's backyard train, the Carolwood Pacific Railroad, and also from Walt's inspiration, animator Ollie Johnston's backyard railroad in La Canada-Flintridge. The Disney experts at the Barn have accumulated many specific artifacts, along with Ollie Johnston's Victorian train depot. I was particularly impressed by the working model of Nature's Wonderland from Disneyland, built with precision (and a careful amount of compression) by Disney Imagineer Sam Towler, who happened to be on hand that day. The model, accompanied by authentic audio from the ride, immediately puts you back in the attraction, which closed January 2, 1977, because the colors and textures are so perfect. The town of Rainbow Ridge is just as I remember it. On that Sunday, I had a chance to meet a number of online-only friends for the first time. As the Barn's website says, "Disney veterans and Legends drop by for chats and autographs." It's true--I was thrilled to meet animator Floyd Norman. We told him he's too young to have worked for Walt Disney and he replied that Walt always called him "Kid." Doug mentioned several new exhibits that the Carolwood Foundation is working on--it's encouraging that the museum is expanding. Apparently, a Mine Train engine from Disneyland is being refurbished at the moment.